If you love the Rebalance studio or are looking for new ways to power up your strength and cardio training, we have an exciting announcement for you. Introducing Irish-born, world-renowned yoga instructor Chris Magee — aka @Mageesy — the newest trainer to join our team! Chris was a fitness fan from an early age, playing rugby and practicing martial arts. Trained as a professional actor and personal trainer, he then went on to clock up nearly 1,000 hours of yoga teacher training! Teaching classes all over the globe, Chris combines his unique skillset and style, to be the ultimate entertainer and motivator. So what can you expect from his classes? 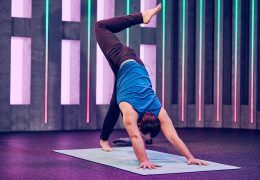 Chris teaches dynamic Vinyasa yoga that will help you find balance between strength and flexibility, in body and mind. Progress through a series of lower body and upper body flows to develop strong foundations and steadily move on to more advanced levels. “There’s a fine line between effort and ease. I’ll help you build core strength and controlled movement with a combination of holds and repetitive moves — always guided by the rhythm of your breath.” says Chris. If you’re looking to explore and expand your capabilities, join Chris in the Rebalance studio. Change your perception of yoga. In Chris’ words, “worry less, appreciate more”, build your technical knowledge and you’ll experience the benefits in no time. See Chris in action in the video below!